“Oh, I really don’t want to focus on money,” said the woman on the phone. A successful executive who worked in training and development for a major corporation, we had met at a networking meeting. She was very interested in my work since she was also in the business of helping people through training, but balked at the idea of taking a class centered on money. Her main goal was to help people and do meaningful work, she said. I often encounter this same idea, stated in different ways, which comes from the root belief that the pursuit of money for its own sake is inappropriate, and maybe even bad (remember “the love of money is the root of all evil”). I’ve heard many, many people say, “I don’t care about the money,” or “The money isn’t important to me.” What they are trying to make clear is that they have a larger objective, a goal of helping others or doing work they love that transcends their need for money. Unfortunately, that is not what they say. Words are powerful. When they speak their word that they “don’t care about money” what they are inadvertently doing is telling their creative mind, God, and the universal power of supply not to send money. Their need to state it this way is indicative that they have a fear-based mentality about money—they are afraid that somehow, if they make a lot of money, it will corrupt them, pull them off course, make them a slave to material things, etc. The universal power of supply that is directed by our creative minds is just a “Yes” machine. Tell it you want money—it says “Yes.” Tell it you don’t want money—it says “Yes.” Your choice. Why not declare instead that “I really want to help and serve people, and making a lot of money will help me do that even better”? Money is neutral—in and of itself it is neither good nor bad. Only the way it’s used can be judged in that way. You have the power to decide to use the money that flows into your possession for good: Donate to charity, expand your work to help more people, beautify your surroundings, give to the arts, invest in worthy businesses doing socially responsible work. Do care about the money! My belief is that all the truly spiritual, wonderful people should have lots and lots of money, because they are the ones who will use it most positively. You have to have some money in this world in order to live. Why not have lots of money in order to live well? 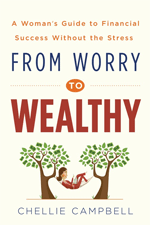 I wrote my new book “From Worry to Wealthy: A Woman’s Guide to Financial Success Without the Stress” to help women specifically counter this tendency to believe being of service means you shouldn’t charge money – or at least not very much – for their services. So many women I meet love helping and serving others, but too often they leave their own good out of the equation, don’t charge enough for their services, and give too much away for free. They don’t like selling, because they’ve been turned off by too many “hard sell” tactics themselves and don’t want to do that. They don’t count their money because they haven’t been shown how financial statements can help them grow, and money isn’t their primary objective anyway. They work too hard at too many tasks and don’t take enough time off to nurture themselves. Psychologically, it takes enormous strength of character to face the fear of financial insecurity that a majority of women live with. An article in the LA Times by Walter Hamilton in March of 2013 noted that “almost half of U.S women fear becoming bag ladies, even many of those earning six-figure salaries.” Although six in ten women reported that they were the primary breadwinners and 54% of them managed the household finances, 49% of women feared become a homeless creature pushing a shopping cart, according to a poll by Allianz Life Insurance Co. of North America. Yikes. Talk about a “Catch-22”! If you’re not financially successful, you’ll end up homeless on the street, and if you are, no one will like you?! You see the problem. Let me unequivocally state right now that you are NOT going to become a bag lady. You don’t have the mind-set nor the skill set for a life on the streets. The evidence is that you are reading this blog! You can start to let go of that fear now. Practice positive thinking about money. Make a list of financial affirmations from this blog or elsewhere and say them with fun, laughter and meaning every day. It will change your perspective and that will change your life–and your money!